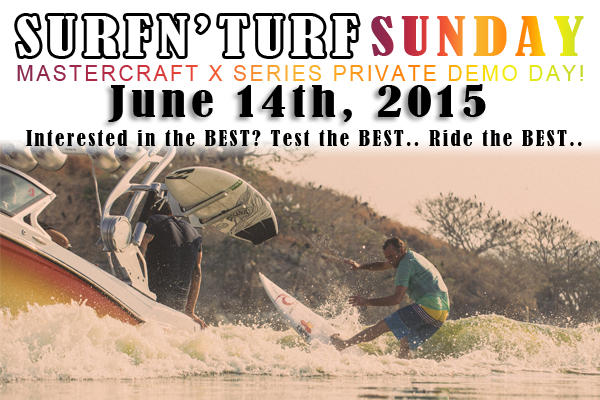 MasterCraft Demo Surf, Ride, N' Drive Day! MASTERCRAFT X20 & X23 DEMO DAY! Interested in getting into an inboard? Better yet, interested in getting into a MasterCraft? NOW is the perfect opportunity for you to step inside (and RIDE!) the all new MasterCraft X20 and X23. Experience it's quality, performance, and second to none surf and wakeboard wakes complimentary of Len's Cove Marina (that means it's FREE..)! Spots run hourly and include 45 minutes of test driving and riding on the water. You can have a MAXIMUM of 4 people in your group. It is mandatory those who are interested in riding know how to surf or board, as this is not for private lessons. ONLY SIX spots are available hourly starting at 9 am. This is FIRST COME, FIRST SERVE! Get your form filled out and submitted as soon as possible to get your hands on one of the best experiences you'll have this summer! Don't Forget, Len's Cove is a 5 Star, Full Service Marina/Resort! We have our on-site gourmet restaurant "The Galley" to curb your appetite after your fun on the water! We look forward to having you on the water with us! - Team Len's Cove Wake Dept.